Intex is a Delhi based electronics company that has come up with a range of low budget smartphones. Intex Aqua 3G Neo priced at INR 3799 is one of the low budget phones that’s loaded with features. The key specification of Intex Aqua 3G Neo is the strong battery (1500 mAh) with talk time up to 8 hours. 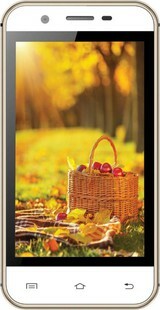 Intex Aqua 3G Neo has 526 MB RAM and has a Quad-core processor with the frequency of 1.3 GHz. It is powered by Android OS v4.4 (KitKat). The display size of the phone is 4-inch with a resolution of 480 x 800 pixels. It has a capacitive touchscreen with a multi-touch feature. The rear camera of the phone is 2.0 MP with flash and the front camera is 0.3 MP. The phone is Dual SIM compatible with mini-SIM. It has 3G connectivity. Intex Aqua 3G Neo is available in trending colors and it has stunning looks that are inspired by an iPhone. The phone is light (105 grams) and has a good grip. Intex Aqua 3G Neo has the functions of an average smartphone at a small price. Intex Aqua 3G Neo full specs and reviews as of Apr 2019. Buy it here!